If you happen to have received an email with the above heading recently, take note that this is a Scam. 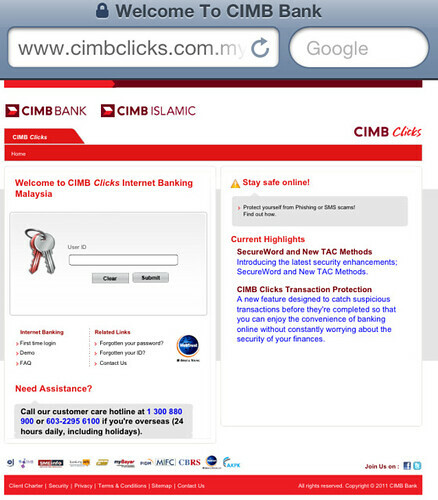 All it is trying to do is to fish you into revealing your sensitive information at CIMB Bank. 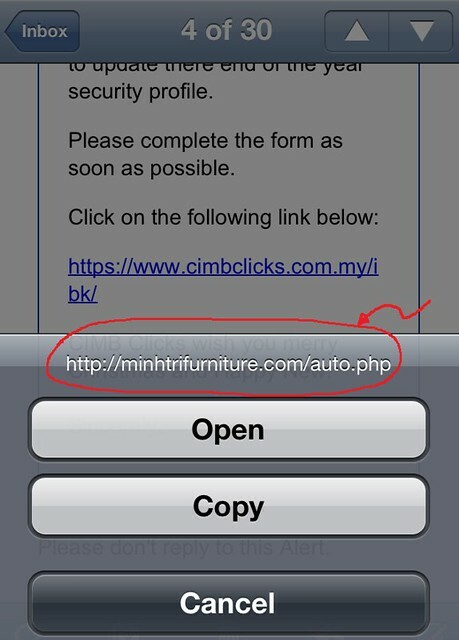 So, if you are a current user of CIMB Clicks you might be particularly interested. I received this on Christmas day on my mobile and it goes into my mailbox probably because I have no spam mail filter installed on my mobile device. It looks authentic at the first glance due to the bank logo on the heading. and the mailing address of this scammer is [anne2.lindh@pp.inet.fi] but I doubt it'll stay that way for long. It is perhaps a dynamically generated email that targets one would-be victim per phishing email. I know this is quite common and it happens all the time but it is always better to to stay safe online and be wary (and worry) of emails purportedly from your bank asking for 'confirmation' of passwords and/or user name. Better safe than sorry. Happy banking. I guna internet banking, thankfully so far no problem. Tapi email drp bank (atau fake bank) saya x layan. Gosh, I receive this sort of message a lot.. but luckily for me being an ex-banker, I knew that it is a spam and promptly delete them. Thanks for sharing though, am sure many people would benefit from this post. Happy New Year and may this coming year be filled with all God's best for you and family.